Each of these short pieces features one of the players, not so much as a concertante soloist as the most prominent amongst equals and at the same time as something of an outsider to the others (this is especially the case in the third and fifth pieces). The tempos and characters of the movements are: (I) Quasi improvisando (oboe) – declamatory, improvisatory; (ii) Molto vivo (bass clarinet) – fast and hectic; (iii) Molto meccanico (bassoon) – machine-like; (iv) Calmo (piccolo) – very quiet, floating; (v) Agitato (horn) – fast and spiky. The total duration is around ten minutes. 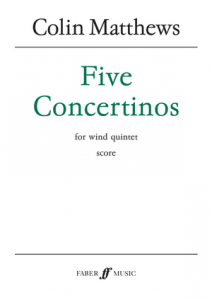 The Five Concertinos were commissioned by the Bath Festival for the Ensemble Intercontemporain with funds made available by the Arts Council of Great Britain, and are dedicated to Henri Dutilleux.